OXO has a new line of feeding products made just for tots. Besides being non-toxic, the entire OXO Tot feeding line contains enough helpful pieces to take you through mealtime at home and snacks on the go. For example, once your little one needs to master eating on his own, the OXO Tot 4 Piece Feeding Set, shown above, is a perfect fit. The set comes with a special plate that has a removable, curved ring and a handy bowl with straight side walls, each designed to help guide food onto your child’s utensils with ease. Both have non-slip bottoms and the OXO Tot’s fork and spoon feature curved handles that are also non-slip and easy for new munchers to hold onto. The entire OXO Tots feeding line is BPA, phthalate and PVC free, plus all pieces are dishwasher safe. Bonus – all of OXO’s new feeding tools come with features that make feeding your toddler a breeze. The awesome Snack Disk, for example, has a nice non-slip base and its fun, curved shape keeps snacks safely tucked inside – easy for little hands to reach but less likely to spill. 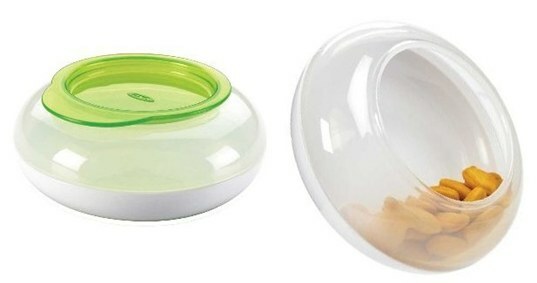 The Flip-Top Snack Cup offers a great compact shape that tucks right into a diaper bag or cup holder for snacks on the go, and the stay-attached lid offers a great solution for those of us who always have more bowls than lids laying around. There’s even a handy OXO Tot Feeding Spoon for brand new eaters. Available in sets of two, the Feeding Spoon has a gentle-on-baby’s-gums protective food-grade silicone coating and a contoured handle that’s easy for parents to hold. All pieces come in vivid green, orange or aqua. OXO has a new line of feeding products made just for tots. Besides being non-toxic, the entire OXO Tot feeding line contains enough helpful pieces to take you through mealtime at home and snacks on the go. For example, once your little one needs to master eating on his own, the OXO Tot 4 Piece Feeding Set, shown above, is a perfect fit. 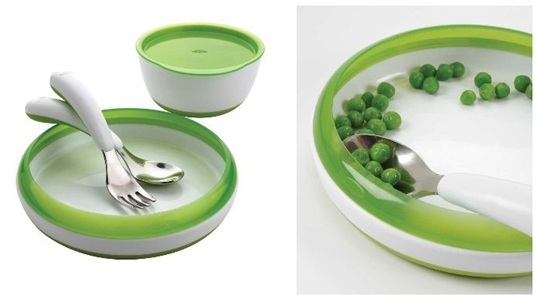 The set comes with a special plate that has a removable, curved ring and a handy bowl with straight side walls, each designed to help guide food onto your child's utensils with ease. Both have non-slip bottoms and the OXO Tot�s fork and spoon feature curved handles that are also non-slip and easy for new munchers to hold onto.